Each time it seems like we have reached the bottom of the pit, but reality proves there to be an even deeper one. Perhaps to those who do not stand in front of the ambulances, the stretchers and the back-to-back procedures the pictures seem the same. But they really aren’t. Each person is a story and on each stretcher is a tragedy. Only the occupation is the same, as well as the rifles, the regulations and the orders. And because of the regulations a six year old child who had severely injured his head at 10 AM with a metal bar had arrived at Qalandiya checkpoint at only 3 PM, although his father immediately after the injury phoned a brain specialist in Amman who told him that the child must be on the operation table within the hour. 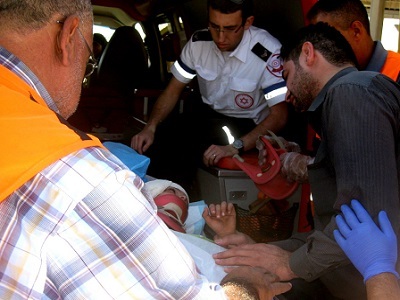 By the time the mechanism of the occupation had permitted the child and his mother (not his father) to pass through to a hospital in Jerusalem, five hours had past. Five hours is a time frame that hands out the verdict of life and death. The child was hazy, his eyes were open but they weren’t focused; his hands rose without purpose and fell down as though on their own, and the father begged that they take him as well with the child to the hospital, so that he be with his child- but no, only the mother could go. The man stood by the child who couldn’t really see him, and touched the child who couldn’t really feel, and talked to him, and the child didn’t really hear, and said to him: “it’s your father, my child, it’s your father…” and kept saying it again and again. The man bent over and touched the child’s body and hands and the tip of his head that remained exposed, as though saying goodbye, and keeping it together until the ambulance drove off and only then did tears come bursting out of his eyes. And from mine once I was on my own.